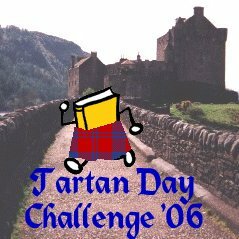 To celebrate Tartan Day in 2006, I (KateKintail) proposed a challenge on the BookCrossing site, wherein people would release Scotland-related books (books by Scottish authors, nonfiction books about Scotland, fictional stories set in Scotland or with Scottish characters, etc.). I hoped that this would help me and everyone else celebrate the day, as well as spread the word about Tartan Day and Scotland-related literature. Congrats to all the winners and thank you ALL for participating!